NoPoPo Mini Lantern Uses That Urine Powered Battery | OhGizmo! Halo RC Vehicles – What Took So Long? Remember the NoPoPo? It was the water-powered battery from Japan that went out of its way to advertise the fact that it could also be ‘recharged’ using urine. Well the Japan Trend Shop is now selling a compact LED flashlight/lantern that includes one of those NoPoPo batteries. 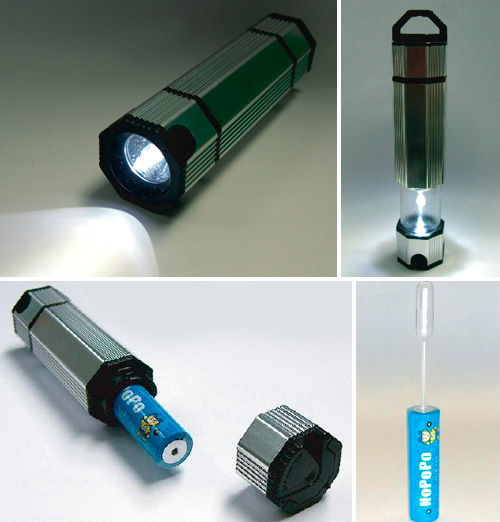 Since the batteries are only rated at 500mAh and can only be recharged 4 times, the flashlight is better suited for an emergency kit as the NoPoPos will hold a charge for up to 10 years. And if for some reason both water and urine are in scarce supply, the batteries can also be topped off using other liquids like beer or soda. It’s $39, which isn’t exactly a steal, but the NoPoPos are AA sized so when it reaches the end of its lifespan you can always just swap it out with a standard AA battery.